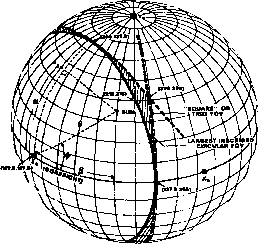 i where w, is the weight of the <th vector measurement and u'A is the vector in the reference coordinate system. The loss function is the weighted sum squared of the difference between the measured and transformed vectors. The attitude matrix may be computed by an elegant algorithm derived by Davenport  and based in part on earlier work by Wahba  and Stuelpnagel . This algorithm was used for the HEAO-1 attitude determination system [Keat, 1977].